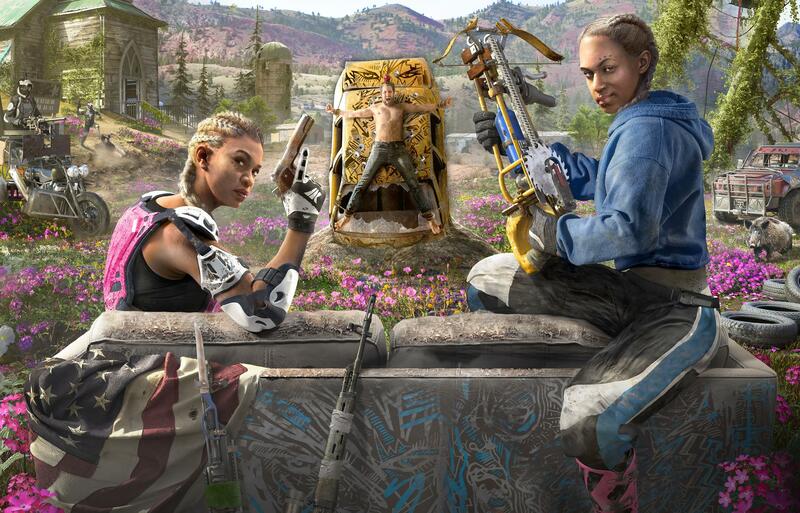 Far Cry New Dawn injects RPG mechanics into the series’ open-world shooter formula – is it a sign of things to come or just a fad? Far Cry New Dawn comes out this Friday, just three months after its official reveal at The Game Awards in December. New Dawn is a post-apocalyptic story, set 17 years after the events of Far Cry 5. The game is indeed a direct sequel to Far Cry 5. You’ll be thrust into a world rebuilding itself after the nuclear apocalypse that destroyed Hope County and many other parts of the world. This particular setting gave Ubisoft freedom to be a little more wacky with the game’s themes and mechanics. Many of Far Cry 5’s features return. Co-op, Guns and Fangs for Hire are all in New Dawn. Then there’s Expeditions, a new feature that’s basically an excuse for the game to take you to other parts of the US outside Hope County. Perhaps the biggest change in New Dawn, however, is that it’s more of an RPG than any other Far Cry. The different locations in the game’s world will have level requirements, and the damage you deal to enemies will depend on your character level, and abilities. This also means crafting mechanics have been expanded, and you’ll be spending some of your time gathering supplies to upgrade your gear. It’d be interesting to see if New Dawn does to Far Cry what Origins did to Assassin’s Creed. One way to gauge that is through reviews, which we’ve embedded plenty of below. Scores, as ever, are out of ten unless noted otherwise. Far Cry New Dawn is out February 15 on PC, PS4, and Xbox One.